If you have ever read through the long list of items that your mechanic places on their bill, you will likely see a recurring charge: replacing your air filter. While this is a legitimate charge and a service which needs to be periodically performed, many motorists are unaware of their air filter, what it does, or how they can replace it themselves. Whether you're looking to reduce your mechanic costs or you just want to be more hands-on with your engine maintenance, NC Synthetic has some information to share. Along with providing you with the best products to complete a synthetic oil change, NC Synthetic can also help you learn about the purpose of your air filter, and how you can replace it without leaving your drive. What Role Does Air Play in the Operation of Your Engine? The best place to start is with a brief explanation of how your engine works and the vital role that air plays in its operation. As you drive, your car's engine utilizes energy produced from its combustion engine. To work, the combustion process requires a mixture of fuel and air for the gas to ignite and power the movement of your pistons. This movement is the very core of your engine and the power it provides. 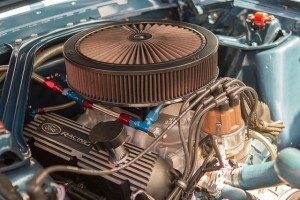 What Makes an Air Filter So Important? If the air that enters into your piston chamber isn't clean, it can reduce the efficiency or your engine. For example, if the air contains high amounts of dust or dirt, this debris can accumulate throughout and rub against crucial parts of your engine, causing wear and damage. This not only leads to an engine that can not perform efficiently, but will eventually require you to replace these engine parts. To stop the debris mentioned above from entering into your engine, air taken in by your engine first passes through your air filter. Filled with fibers, your air filter traps this debris and ensures that only clean and purified air enters into the fuel mix. The cleaner the air, the more efficient and effective the combustion process, which leads to better performance as you drive. Given the important role your air filter plays, ensuring you use the right air filter for your engine is crucial. Speak with NC Synthetic at (919) 624-2934 and let us know the make and model of your engine. While you may know us for our range of products you use for your synthetic oil change, NC Synthetic stocks high-quality AMSOIL air filters and has the right one for your vehicle. This can be a tricky question to answer. Under regular driving conditions, Toyota advises changing an air filter roughly every 36 months. However, if you are frequently driving through dusty conditions, then you will need to change it more often. If in doubt, take out your air filter and give it a visual inspection. If it's seen better days, it's time for a replacement. Which brings us to the task: how you can replace your air filter at home without visiting your mechanic. With the correct replacement air filter by your side, secure your car and open the hood. The location of your air filter depends on your individual engine. However, it is likely to be situated on top of your engine and covered by a large plastic housing. If you are unsure, look for a 'lid' which is being held in place with clamps on either side. This is a good indication that your air filter is inside. Once you open the clamps, remove the housing. You will now see a rectangle shaped object filled with slots of fiber, cotton or paper. This is your air filter. Simply lift it out and put it to one side. Once you have removed this, give the container it was sitting in a clean to remove any dust or debris that may be left over. Take your new replacement air filter and insert it in place of the old one. Once the new air filter is securely in place, take the lid and give it a clean. Afterward, replace it onto the housing and replace the clamps to secure it tightly. Close the hood - you're done! There you have it! You have now changed your air filter. Not only are you now empowered with more engine knowledge and confidence, but you can also reduce the costs of your next visit to the mechanic. To continue the momentum, speak with NC Synthetic at (919) 624-2934 and ask about how easy it is to give your engine a synthetic oil change. Combined with a range of high-quality AMSOIL products to choose from, NC Synthetic have the expert knowledge to help you choose the right oil for your engine and get you on your way to completing your own synthetic oil change.